the customer is wanting or needing. Latitudes carries a large selection of import and craft beers. Latitudes is the first store of its kind to hit the Rio Rancho & Albuquerque area. Latitudes is the first store of its kind to hit the Rio Rancho/Albuquerque area. 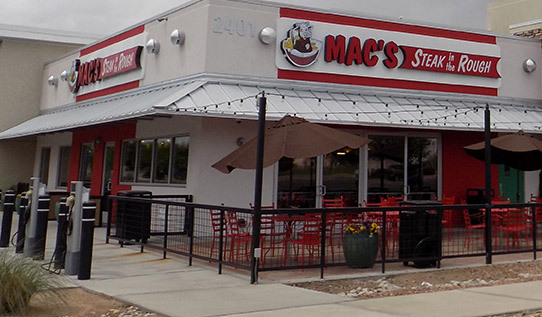 Combining the elements of a neighborhood market, Mac’s Steak in the Rough burgers and hot dogs, and a convenience store with competitive gas prices. All available 24/7! Latitudes offers customers a whole new world of convenience. So come to Latitudes in Rio Rancho to enjoy our friendly staff, clean facilities, quality products, exclusive rewards program, and make Latitudes your go-to destination for just about anything! 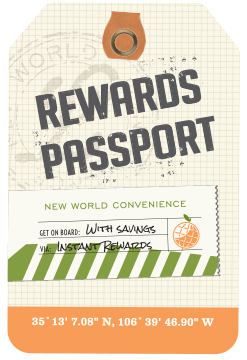 Our Rewards Passport card that earns you discounted gas, coffee, and fountain drinks. We offer grocery store prices, competitive egg and milk pricing, fresh fruit and produce, ready-to-eat salads, fruit cups, pet food, pet supplies and more. Why fight the big box store’s parking lot when you can get in and out for those little items you need to pick up with ease? Whether you are looking for a California Red Blend, Pinot Grigio, Zinfandel, Cabernet Sauvignon, or even a chilled bottle of Chardonnay, Latitudes is your one-stop-shop for a wide selection of wine at the best value. All available 24/7! Latitudes offers customers a whole new world of convenience. So come to Latitudes in Rio Rancho to enjoy our friendly staff, clean facilities, quality products, and make Latitudes your go-to destination for just about anything!